Indie games have really been knocking it out of the park, lately. But they don’t always get the recognition they deserve. This showcase looks at five indie games of varying levels of popularity that you may have missed. We take a look at what the game is all about, who developed it, sometimes looking at why and how these teams developed their games. You’ll hear about the gameplay, where to get the game, and any plans for new content related to the game. Hollow Knight is a game set in a dark, desolate, underground world. Hollow Knight is beautifully animated in 2D. The environments, creatures you encounter, and action animation are all gorgeously melancholy. Screenshots from the game feature washed out blues, purples, and greens–excellent choices for the melancholy underground adventures of Hollow Knight. Hollow Knight was built with Unity. And you can catch the original release trailer here. Much of the game music is also beautiful. There are tracks you can appreciate even outside of the context of the game. The music was composed by Christopher Larkin–we recommend popping over to Bandcamp and giving a few songs a listen (Enter Hallownest, the first song on the digital album, is a fine place to start). Team Cherry the developer team behind the game, consists of four people. 2.) William Pellen is the other game designer on the squad. He handled the behavior for bosses, enemies, our dear hero Hollow Knight, and the game in general. He is also the one to blame “if an enemy seems too challenging or a gauntlet insurmountable”. At the very least, these guys have a good sense of humor (though, with a game like Hollow Knight under their belts, with more on the way, they make way more than comedy gold). 4.) Matt ‘Leth’ Griffin is the go-to guy for marketing, testing, and translating the game. He’s the PR guy. Prior to Hollow Knight he took on PR roles for Stardew Valley, Interstellaria, and Wanderlust Adventures. Team Cherry is based out of South Australia (Adelaide, to be exact). 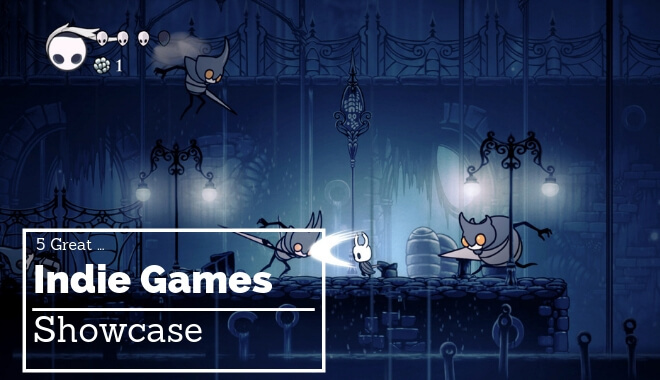 Hollow Knight is an action-adventure game that tasks players with exploring the cavernous kingdom beneath Dirthmouth. There are traps to evade, corrupted beasts to fight, and “an ancient long-hidden mystery” to solve. To do this, you’ll need to learn new skills and find new equipment throughout the game. You can currently find Hollow Knight on Steam, though that’s not the only place to find it. It’s available on gog.com and at the Humble Store as well. An Updated Version of Hollow Knight is Coming Soon! These changes, coupled with the new content the devs added, are being released on the Switch as the newly titled Hollow Knight: Lifeblood. The Beta is getting into PC players’ hands first for final rounds of playtesting. Once the game is where it needs to be, Team Cherry will give the game a proper release on GOG, the Humble Store, and Steam. Team Cherry is giving constant updates on their Switch port progress, but ultimately they’re committed to bringing the best version of the game that they possibly can to the console. As per their latest update: they’re going to need more time. There’s no official Switch release window at this time. Dumb Luck Games released Retro Highway in the middle of April 2018. Dumb Luck Games has been working on this idea since as early as October 2015. The team’s known influences for this mobile game are OutRun and Road Rash, a couple of classic Sega titles. The development team consists of two people: Constantine Berg and Nicolai Danielsen. The two met on a forum and joined forces to make this game. So the game came from a soundtrack, a new forum-forged friendship, and a healthy dose of nostalgia. Retro Highway gives players a real sense of speed as a motorcyclist racing down a traffic-plagued highway. You feel every boost, every crash, and every landing as the “camera” shakes behind you down the highway. Players score points and coins by doing tricks and navigating the challenges the Retro Highway throws at you. You can use your coins to unlock new bikes (over ten available) in between your races. You can also invest in upgrade power ups. After you complete enough challenges, you’ll unlock a new stage. You can catch the release trailer on touch arcade. Retro Highway is available for free download on your mobile device or your tablet (so check the in places like the App Store). For a couple bucks you can disable the ads in the free version for some uninterrupted, high octane motorcycle racing action. The download size is currently 73/5 MB, so free up some space on the ol’ phone hard drive if you haven’t already! Hidden Folks is a game that’s received a lot of praise and award nominations, but you still might have missed it. The two met in 2014, largely by chance, and a joke about making a game together quickly turned into Hidden Figures less than three years later. Hidden Folks also had contributions from: Mirthe Venbrux, the assistant producer; Martin Kvale, the video game sound designer; Aran Koning, the assistant programmer; Bram van Dijk, the writer. The partners continue to add and develop new content for the game, and have expanded from an original 15 areas to over 20 hand-drawn areas for players to explore. The game has the nostalgic feel of a Where’s Waldo book…except everything is interactive and moving! The illustrations are wonderful and really help make the game what it is. Players will get a strip of targets on each level showing them what to look for. They can tap each target if they need a hint. Once they find enough of the targets on a specific level, they will unlock the next area. Hidden Folks is easier to find in digital stores than some of the in-game targets you’ll be looking for. You can find it on Steam, Google Play, and the App Store. The computer version retails for $7.99 while the mobile and tablets version retails for $3.99. If a game makes Havok smile, you know it’s a light-hearted, pleasant way to pass the time. You’ll have as much fun hunting down objects as you will simply enjoying the illustrations and animations. Claybook was designed and published by Second Order. The studio was formed in 2015 (in October, wouldn’t you know it…) by two people: Sebastian Aaltonen and Sami Saarinen. They both worked as game developers together on the Trials game series prior to starting their own studio. Claybook is built with a technology they developed in-house, which they refer to as Clayfield. They relied on the Unreal Engine 4 to build their clayfield tech. If you want more of the technical info, you can check out Sebastian Aaltonen’s tweet thread. The videos make this game look like a bunch of fun. You’re using certain clay objects at your disposal (a clay ball, a clay cube, even a clay rocket?) to solve challenges in each chapter of the game. The game is compatible with up to four local players. We always appreciate when developers include split-screen play–something that many of the AAA titles have been steering away from for years in favor of online multiplayer. Player creativity can take shape through an “amazing in-game creation tool that lets you build your own books and chapters and share them with the Claybook community.” No modding, coding, or technical skills necessary in order to take advantage of these tools. Claybook is available in its early access form on Steam, and in it’s game preview form on Xbox Live. There are plans to bring Claybook to PS4 later in 2018. The game is also available through a Humble Bundle sales widget on the game’s homepage: you’ll get a Steam key to access the game and the developers receive a greater portion of the purchase. What happens when a human shares his body with the soul of an ancient thunder dragon? Tolga Ay started developing Remnants of Naezith in August of 2014. He is a student at Yildiz Technical University in the department of Computer Engineering. He’s also a competitive FPS player for games like Overwatch, Quake, and Team Fortress 2. It’s his love of fast-paced games, quick reaction times, and finely-honed skills that led him to developing Remnants of Naezith. He had some help on the game with level design, technical support, graphics, playtesting, etc. The game features four chapters, with 20 levels in each–not including the secret levels only unlocked by finding the hidden remnants. Remnants of Naezith features leaderboards (which feature top player replays) so you can see how the best players are setting their records. The game also features a custom level editor, which lets you build, share, and explore levels built by the community. You can download Remnants of Naezith on Steam, where it’s available for $9.99. These are just a few comments we pulled from the 200+ reviews left on Steam. The general consensus is: the game’s mechanics will push you to try and master the game, to do the level faster, to watch how the fastest players do it and emulate them. This is a game for players who want to push their platforming skills to the limit.